Our client, Beaufurn Furniture, wanted to create some high-end product line videos for their website. They wanted their customers to understand the quality and craftsmanship of the furniture. They also wanted their customers to get a good understanding of the variety of products within each product line. They knew that video was the best way to communicate this information. An obstacle to recording the furniture pieces was that their budget was not big enough to rent studio space for the video shoot. We came in and brought forth a solution. After a site visit to their factory, we decided that we could make the shoot happen onsite without having to rent studio space. The biggest challenge was making a white seamless background in their factory and keeping it clean as we moved furniture on and off of it. Another challenge was clearing a big enough space for us to set up our lights, camera and dolly. The third challenge was having the pieces easily accessible and having a team available to move the furniture on and off set. We unrolled and hung up a huge piece of background white paper to use as our background. We used long sheets of white paper as our “walkway” to place the furniture on the seamless white paper. 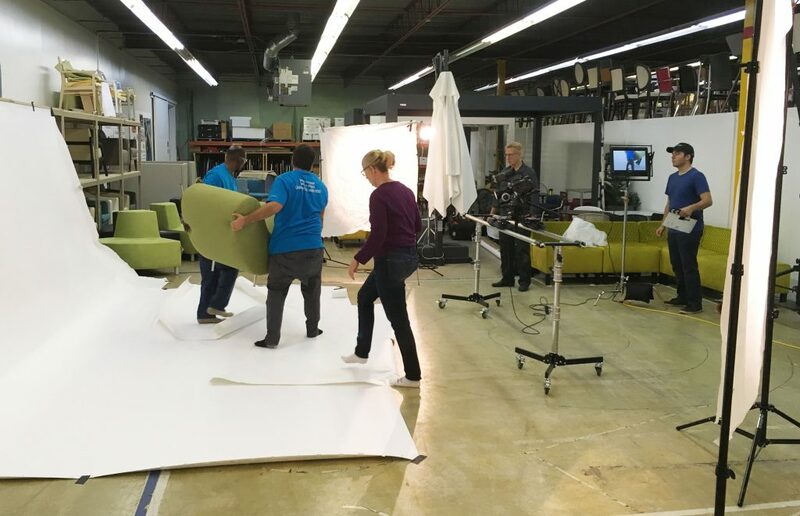 It was a great team effort that allowed us to quickly videotape more than 20 pieces of furniture during our one day shoot. Please contact us if you are ready to talk about your product video. We’ll work with your budget and offer solutions that reduce expenses. We promise that it will be the best marketing investment that you make! Please give us a call at (336) 403-9273 to speak with a Charlotte Video Production company, or fill out our contact form. We look forward to helping your business use video to achieve your goals.